Every fan, including me, thinks their team gets a rough deal from the umpires. But which team, on average, tends to get more free kicks? The West Coast Eagles are the clear league leader. 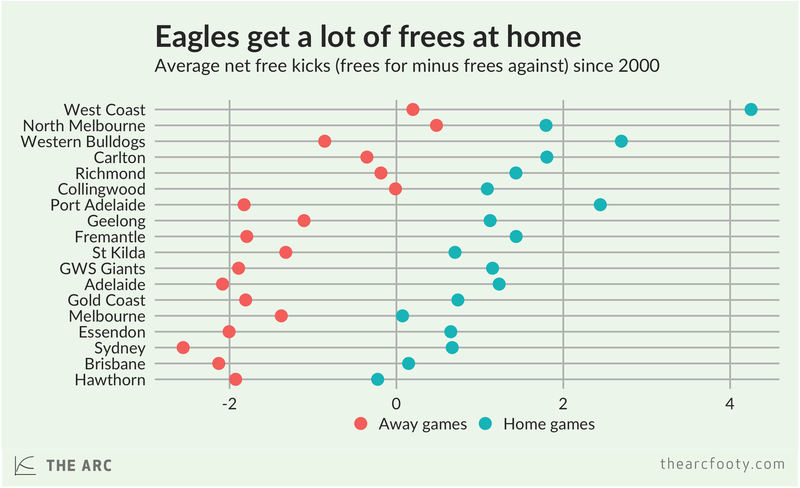 When they play at home, the Eagles receive more than four net free kicks, meaning that they are given four more frees than they give away. They also score the second highest average number of net frees when playing away from home. Not all “home” grounds are alike. The Saints, for example, play an annual game in New Zealand, while the Kangaroos and Bulldogs have played all over the place for a bit of extra cash. These teams might not do as well at these “home” grounds as they do when they play at their traditional homes. So what do teams’ records look like when playing as the home team? The Eagles’ home ground advantage in net free kicks at Subi is still the biggest in the league, but the Giants at Manuka and the Bulldogs at Docklands are not far behind. 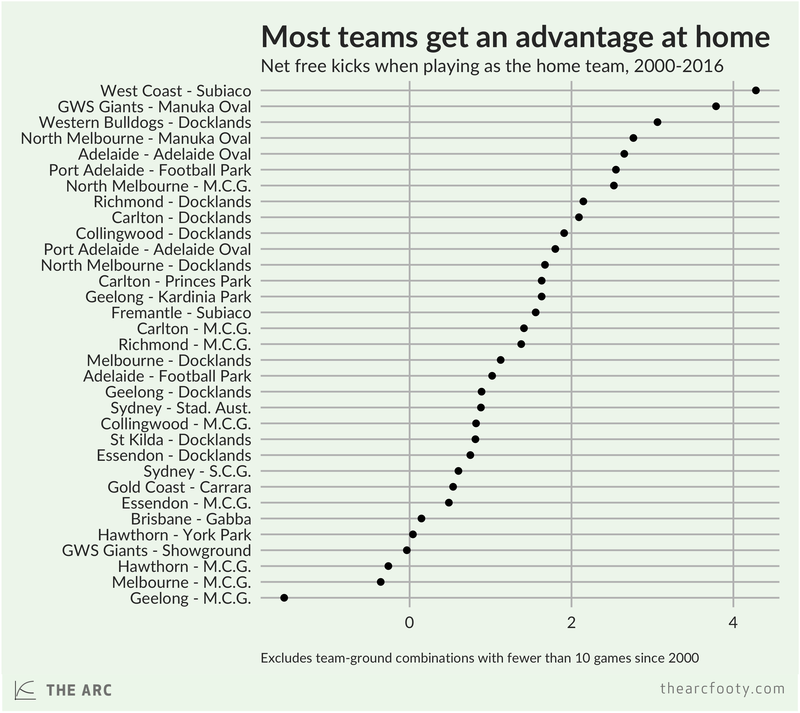 Geelong has quite a hefty home ground disadvantage in free kicks when playing at the MCG – probably reflecting the large number of opposition fans that show up to their “home” games in Melbourne. Teams gain a home ground advantage for a whole range of reasons. Players are more familiar with their own grounds, which helps, and the opposition will often have to travel, which also helps. Home supporters can play a big role in motivating their team. But supporters also seem to sway umpires by a small, but meaningful, amount. Note: This post only includes home and away games (ie. it excludes finals). It includes games up to and including Round 4, 2016. Previous article	← The AFL gets what it wants, but then changes its mind.